Grady will love this. At this point, his favorite thing is sweet potatoes and any type of carbs. 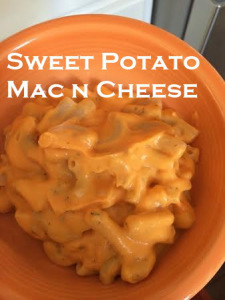 Sweet potatoes are the main ingredient in this creamy version of every kids’ favorite meal, macaroni and cheese. I would like to state that I see nothing wrong with the real deal. It’s creamy, delicious, and comfort food in every sense of the word…but this meal is filled with veggies and is dairy free so it’s a double win right now! Jack has been chowing down on this since he was a year old and he loves it! Bake 4 medium sized sweet potatoes. Remove skins and place in blender while potatoes are still hot. Blend the potato and add plain almond milk (you can use regular too ) until you get the consistency you are looking for. Probably about a cup. It should look like a thick alfredo.